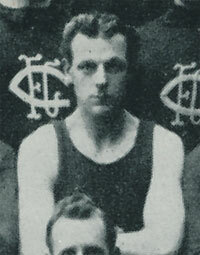 Wearing guernsey #29, Stewart played 8 games and kicked 1 goal after first pulling on the boots for the Blues in Season 1918. Stewart was recruited from Richmond, he had previously played for Williamstown VFA. Whilst at the Tigers, Stewart played 31 games from 1915 to 1918. Page last modified on Sunday 26 of May, 2013 08:50:56 AEST by Bombasheldon.